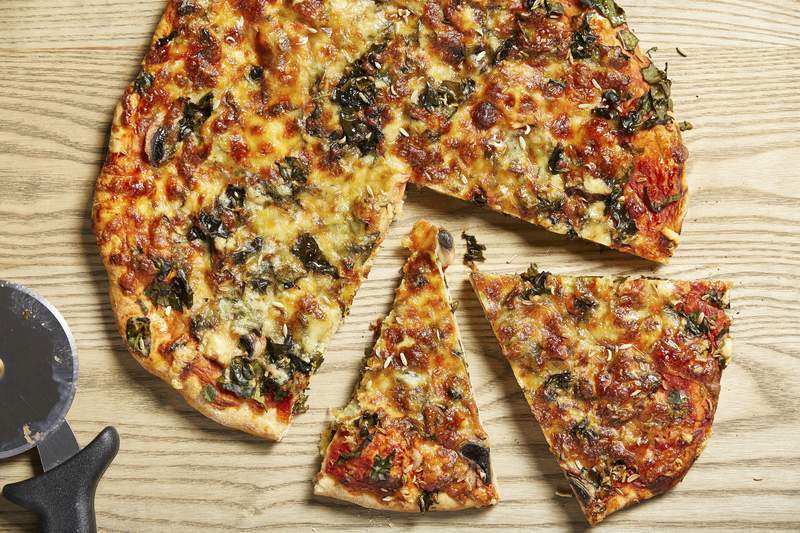 Tom McCorkle | Washington Post Making homemade mushroom and kale pizza is an easy and delicious way to save money. 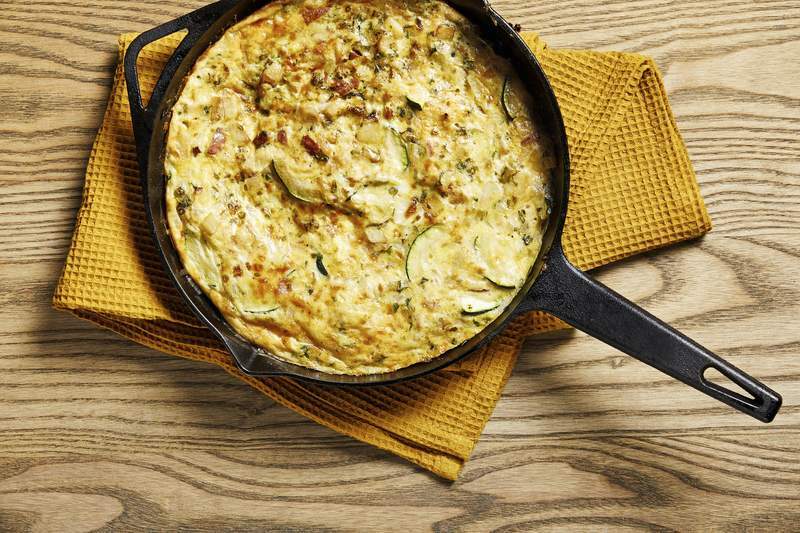 Tom McCorkle | Washington Post Use any number of vegetables in the refrigerator in a vegetable Frittata. Right about now, a lot of us are feeling anxious about money. I know I am. Like most Americans, when I look at my expenses, most of them are fixed. I can't cut back my monthly mortgage, health insurance or student loan costs. I don't have cable TV or other low-hanging fruit in my budget, so the need to save money leaves me staring down one big adjustable line item: food. In America, we don't have what the Italians call cucina povera, or poverty cuisine. During the Depression, he said, most Americans, accustomed to a bland, meaty diet, followed the advice of the new Bureau of Home Economics. “They advocated a whole new way of eating that focused on getting the most bang from your buck nutritionally,” he said. Flavor, however, was not a consideration. Recipes published by the bureau included baked onion stuffed with peanut butter. Immigrants, on the other hand, leaned hard on their traditional food cultures to enjoy meals even without much cash for ingredients. “Italians gathered wild dandelion greens from vacant plots, stewed them with olive oil and garlic, and served them over toast,” Coe said. Sounds like a 2019 restaurant dish to me. I've always been inspired by my Italian roots. My mother-in-law recalls her own Italian grandmother foraging for greens. So it's no surprise that as I started meal planning on my new budget, the dishes I made skewed toward cucina povera. • Cut down on food waste. It costs the average American $38 a month. When it comes to making pizza, I strategize to ensure that any leftover ingredients are portioned for long-term storage. For example, I buy decent mozzarella by the pound from a cheesemonger. I cut the block into five roughly 3-ounce pieces, using one for pizza now and wrapping the remaining four tightly and storing in a zip-top bag in the freezer for later. I start with a 28-ounce can of whole tomatoes, blitz them with my stick blender, and divide into five one-cup containers, using one and freezing the rest. Even my dough recipe makes a spare ball to freeze for later. Over the years, I have come to refer to this as “the pizza system.” It means I almost always have what I need to put a cheese pizza on the table without a trip to the store, and I never throw ingredients away. I try to apply this systematic, use-it-up thinking to all my meal plans. • Be flexible. Pizza is adaptable, and if you have stray veggies in the fridge, chances are they will taste good on a pizza. But if I don't have anything on hand, I stick to hearty vegetables. Those packages might be more than even I can fit on a pizza. • Enter the frittata, a dish that will run you about $1.25 per serving. This easy, economical, open-faced omelet rescues a wide variety of crisper rejects from the compost bin. Frittata is good for breakfast, lunch or dinner; hot or cold; alone, with a salad, or in a sandwich. I don't think one bite of frittata has ever gone to waste on my watch. Almost anything you like on top of pizza, you will like married with eggs in frittata form. • Enjoy making the best of things. Another budget meal very close to my heart and heritage is pasta. 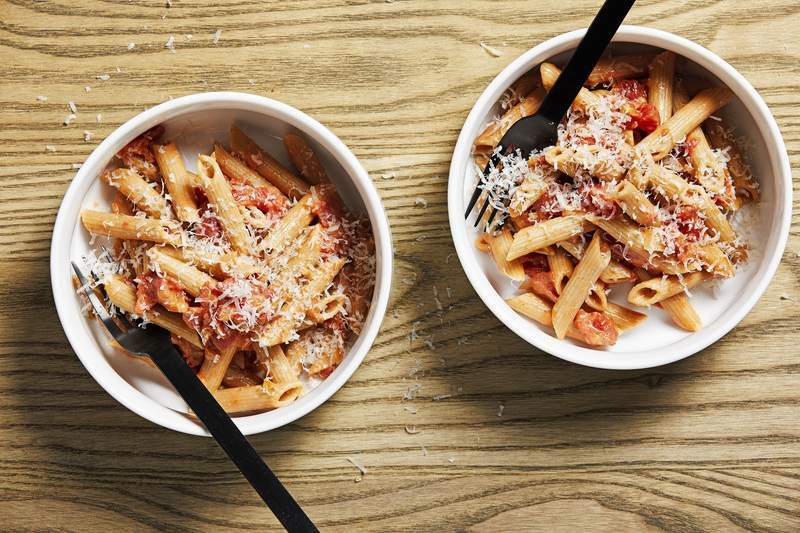 Pasta is somehow luxurious, even though it costs only loose change per serving. Adding a little sour cream – the poor man's creme fraiche – to your tomato sauce enhances that impression. So does a light flurry of salty Romano cheese. Whole-wheat flour adds fiber and a nutty flavor, but you could use all bread flour or even all-purpose for this pizza dough. The fennel seed is optional, but it suggests sausage in such a way that makes this meatless meal seem more substantial. It's helpful to use a pizza stone, but a rimless or overturned rimmed baking sheet can work. The pizza dough needs to rise in the refrigerator overnight. Leftover pizza can be refrigerated for up to 2 days. Combine the bread flour, whole-wheat flour, yeast, salt and sugar in a food processor. Pulse a few times to mix. With the motor running, gradually add the warm water and oil. Continue processing until a ball of dough forms. (It's OK if some dough sticks around the edges.) The dough will be sticky at this point. Grease the inside of a large, lidded container with a little oil, then transfer the dough to the container. Cover and let the dough rise in the refrigerator overnight. About an hour before you want to make pizza, place your pizza stone on the middle oven rack; preheat to 500 degrees. Also, remove the dough from the refrigerator. Divide the dough in half (about 14 ounces each). Put one dough portion in a zip-top freezer bag and store in the freezer for another time. Form the other half into a ball and return it to the lidded container and leave it on the counter. Spread the tomato sauce on the round of dough, then season it lightly with salt. Scatter the onion, mushrooms, kale leaves and fennel seed evenly over the surface. Top with the grated mozzarella and cheddar. Place the tip of the pizza peel toward the back of the pizza stone; use a fast, confident yanking motion to slide the pizza onto the stone. (Or place the baking sheet into the oven, at this point.) Bake for 15 minutes, until the cheese is bubbly and starting to brown and the crust is crisp. Transfer to a wire rack and cool for at least 5 minutes before serving. Consider this recipe a weapon in the fight against food waste, because it will take in almost any vegetables overstaying their welcome in your crisper. Replace the mushrooms, kale and onion here with about 3 cups of whatever ingredients you need to use up. You can also toss in any type of cheese you have instead of the pecorino. Leftovers can be refrigerated for up to 3 days. Position a rack about 4 inches from the broiler element in your oven; preheat your broiler. Add half the oil to a well-seasoned 8-inch cast-iron or other ovenproof skillet over medium-high heat. Add the potatoes; partially cover and cook for 5 to 8 minutes, until they are just starting to soften and brown. Add the remaining 2 tablespoons of oil, the onion, kale stems, mushrooms and 1/4 teaspoon salt, stirring to coat. Cook for 5 to 8 minutes, until the vegetables are tender. Add the kale leaves and cook for 1 minute, or until just wilted. Stir the garlic, the remaining 1/4 teaspoon salt, the pepper and half the cheese into the eggs. Pour that mixture over the vegetables in the skillet and stir briefly to incorporate. Reduce the heat to medium; cook, undisturbed, for about 5 minutes, until the edges appear set. Scatter the other half of the pecorino on top of the frittata. Transfer the skillet to the oven rack; cook for 3 to 5 minutes, rotating for even browning, until the frittata is cooked through and browned on top. Watch closely so the frittata does not burn. Let stand for 5 minutes before slicing and eating. Melt the butter in a large saucepan over medium heat. Stir in the onion; cook for 5 to 8 minutes, until the onion softens and becomes translucent. Add the tomato paste, garlic, salt, sugar and crushed red pepper flakes; cook for about 1 minute, until the garlic becomes fragrant. Add the tomatoes; once the mixture begins to bubble at the edges, partially cover and cook for about 5 minutes, until slightly thickened. Reduce the heat to low, then stir in the sour cream until well blended. Keep warm over low heat. Bring a pot of generously salted water to a boil over medium-high heat. Add the pasta; cook for 2 minutes less than the package directions indicate (to al dente consistency). Before draining the pasta, reserve 1/2 cup of the pasta cooking water. Return the drained pasta to the pot. Pour the warm sauce over the pasta and toss to coat, then add 1/4 cup of the reserved pasta cooking water, stirring to incorporate. Cook over low heat for 2 minutes, stirring and adding some or all the remaining pasta cooking water, as needed, to achieve the sauce consistency you prefer. Top each portion with grated cheese, and serve hot.